In my right mind, I should have declined the invitation. 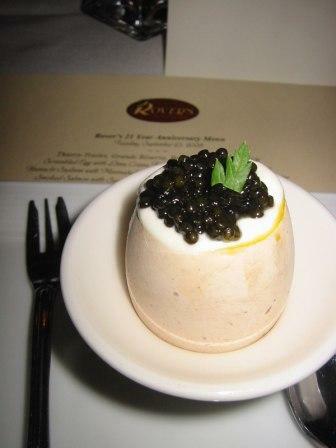 An elegant multi-course dinner on a Tuesday night? With wine pairings? And a 4:00 am wake-up call the next day for an early flight east? But my right mind lost out to my inner pouty 4-year-old who didn’t want to miss out on the fun. After all, how could I skip the opportunity to help celebrate this milestone of one of my favorite chefs in town–the talented, hilarious, be-hatted Thierry Rautureau, who I worked with to bring Rover’s: Recipes from Seattle’s Chef in the Hat to life? Couldn’t do it. crab, lobster and turbot, oh my! the same menu (a copy of which is available for browsing here). 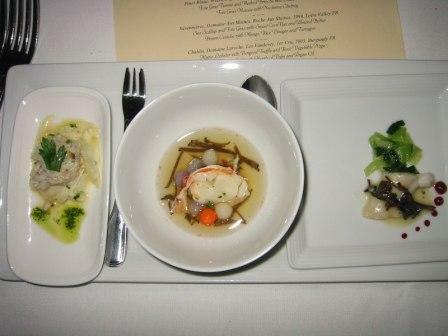 The menu featured 21 small dishes, one for each year of operation, served 2 or 3 at a time in 9 waves. The right mind did hold sway after the fifth wave, the clock about to strike 9:00 and still a few rounds to go. That inner 4-year-old was tired by then anyway. I did manage to miss some delicious bites but was quite contented with the few different servings of foie gras–terrine served with Sauternes gelée, pan-seared with baked peach and blackberry gastrique, an ethereal mousse with nectarine chutney and seared scallop with foie gras and sweet corn. 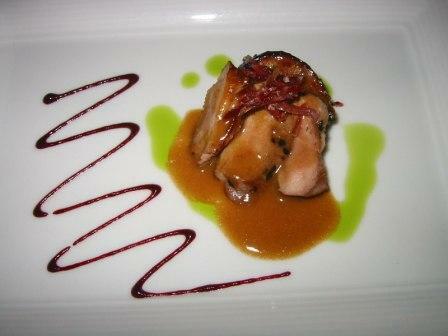 And my last bite was among my favorites of the evening: quail with fig, duck prosciutto and roasted garlic. dinner there about 18 years ago. A recent Friday lunch to celebrate a work anniversary of his was the latest Rover’s extraveganza. The place has never failed to make me swoon, to make me leave feeling happy and indulged. Distinguished, creative dishes in an environment that’s engaging, warm, relaxed. It’s something we all deserve to treat ourselves to from time to time.